Enjoy creamy and cozy vegan peanut butter pudding in a flash with only five ingredients. Unbelievable, but it is true and the process is very simple and easy. Imagine peanut butter pudding that is creamy and delicious. It is so soft that it will melt in your mouth almost instantly. The five ingredient vegan peanut butter pudding is a success and you can change a few ingredients according to your taste. This recipe is thick, creamy, peanut buttery, naturally sweet, delicious and very easy to make. This recipe is a perfect as well as a healthy treat when you have carvings for a dessert snack that is cool and is ideal for the summers. The vegan peanut butter pudding recipe starts with full fat coconut milk and arrowroot starch to thicken. Cook this for about five minutes until it turns thick and pudding like. Without flavor this mixture will not taste great. So, now it’s time to add flavor in the form of peanut butter, vanilla and maple syrup. If you don’t like maple syrup, you can add date syrup if want. Dates are extremely healthy and tasty. Maple syrup makes this recipe taste naturally sweet. When all of this is mixed together the resultant pudding mixture turns creamy. After mixing all this well, the pudding should turn smooth and have a nice and delicious texture, color and the required thickness. This tasty vegan peanut butter pudding is topped with coconut whipped cream and crushed peanuts and a 2 ingredient chocolate ganache. Pour a layer on top and you will have a peanut butter cup surprise. Enjoy it plain with a chocolate ganache or as a pie filling. 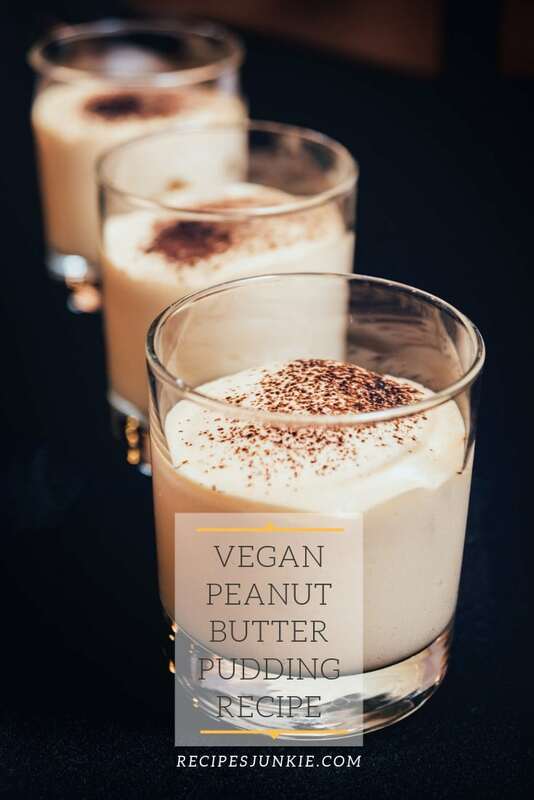 So let us see how to make this deliciously creamy vegan peanut butter pudding with a perfect balance of salty and sweet flavors, which will be an instant hit at any parties, especially when the party has more kids. Mix in full-fat coconut milk and arrowroot starch to a large sized saucepan and mix well to combine all the ingredients. Cook this over medium heat until bubbly and is properly thickened. This will take about 5 minutes. Pour the mixture into a large mixing bowl and allow it to cool for about 10 minutes. Cover the mixing bowl with a cling film or wrap so that it touches the surface of the pudding (to prevent a film). Refrigerate overnight or until the mixture is thickened and cold. You can serve it as it is or top it with coconut whipped cream, crushed peanuts and or chocolate ganache. You can also use this for a pie filling. Any leftovers can be stored in the refrigerator for up to five days. To make a ganache from chocolate, you will have to melt a cup (120g) chopped vegan dark chocolate with 120 ml full-fat coconut milk in double boiler over medium heat. Mix this well to combine until a smooth and creamy texture is achieved. Pour this over the pudding and cool it for a rich chocolate topping. Quantities need to be adjusted according to the serving size of the recipe. If you use dates syrup instead of the maple syrup, the texture may not be very smooth, but the pudding will be delicious for sure. The following measurements need to be followed for a deliciously tasting smooth texture. Soak the dates and drain the water. Add the soaked dates with the peanut butter in a blender along with coconut milk, vanilla extract and starch until you get a creamy texture. Take a large saucepan and thicken this mix over medium heat and then transfer it to a bowl and set it in the refrigerator to chill completely and to thicken. The vegan peanut butter pudding is a perfect dessert for the warm weathers because you eat it chilled and tastes creamy and out of this world. You can eat it as it is or add a drizzle of caramel sauce or any other sauce of your liking.